Status: Alien with some native varieties. Low pest factor. Where It Grows: Upcountry. Wet side by the ocean. ‘Äkulikuli is one of the few foods that can be used for bacterial infections, particularly in the intestines. Most of the herbs used for infections are too bitter to be used as food. It can be used as a pot herb or eaten raw. ‘Äkulikuli is very useful topically for bruises, swellings and sprains. 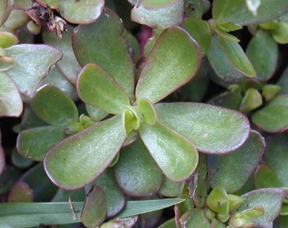 It can be used as a reasonably good substitute for Naupaka ‘o ke kai (Scaveola spp.) fruit for moistening other herbs in a poultice. It has anti-inflammatory properties even when used alone. One of the few local plants, along with Mämaki (Pipturus spp.) and Hilahila (Mimosa pudica) used for treating PMS. In Central and South America, the Middle East, Indonesia, and Asia it is used internally for parasites, intestinal disorders and dysentery. In China, Purslane is combined with Dandelion (Taraxacum spp.) for intestinal abcess. Cautions: Not in pregnancy. Take care in weak digestion. Please note that eating too much at one sitting may cause stomach distress.